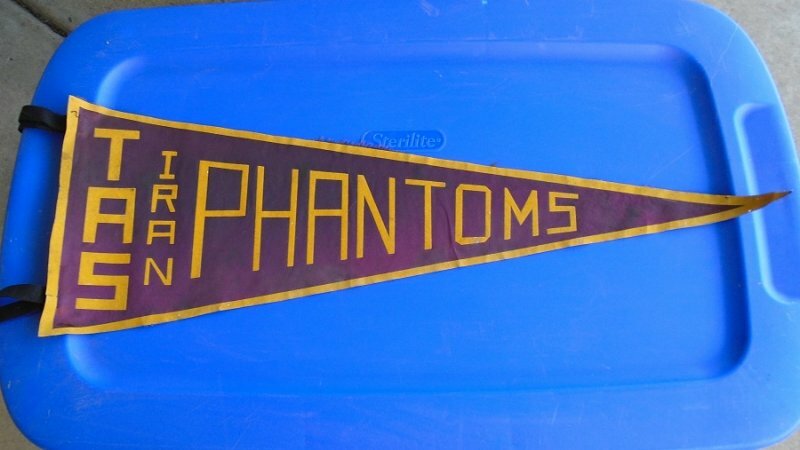 Vintage 1950s to 1979 TAS Iran Tehran American School pennant banner. 29.5 inches long, burgundy in color. Estate purchase. This pennant is from the Tehran American School, also known as TAS. (I have two of this banner, both exactly alike, if you'd like both just change the quantity to 2). It is deep burgundy in color and is possibly made of a satin type material. The vertical side measures 9.75 inches long and has 2 double felt strips for tying it to a pole or display. The horizontal side measures 29.5 inches long. When held up to the light I can see two tiny pin holes where it was probably tacked to a wall. While researching TAS, I found very informative information on the Wikipedia site. It states that the school was actually started in the very early 1900s but went through several name changes. If I followed the timeline correctly, it became the Tehran American School in the 1950s. The school closed for good in 1979, so the dates of 1950s to 1960s that I was given when I made the purchase should be correct. Also, just for a bit of history, General Norman Schwarzkopf, famous for his role in the Gulf War, was a student in 1950 and 1951. As stated, I have two of this particular banner, both exactly alike. (This listing is for a quantity of one). Both are in about the same condition which I believe to be very good. One (the one in my photo) has about a 3.5 inch length of fraying about in the center at the top. You should be able to see this in my photo. I see one small tear on each that measures about 3/8 ths of an inch. One (not the one in my photo) has a stain towards the pointed end, but the stain blends right in with the coloring of the banner and is almost un-noticeable. The first purchase will receive the better of the two banners. Delivery will be via USPS First Class Mail Parcel from California. Buyer to pay delivery charges of $3.99.